Today vinyl windows become more and more popular among householders. Though if you say something like “I love my replacement windows!” you might hear chuckles and ironic laughter. Here is the article about the advantages and disadvantages of vinyl windows. Price. Vinyl windows are much cheaper than any other type. If comparing prices even on the Internet you’ll see that vinyl window replacement, for example, in Atlanta will beat all the other prices. Non-Conductive. During the winter time vinyl window replacement will protect your house from transfer of cold and make it warmer. On the other hand, in summer they inhibit heat movement into the air-conditioned house. Wooden frames have the same properties but have many other disadvantages to beat this one advantage. Aluminum frames will at the same time easily transfer outside temperatures into your house. No Painting Needed. Vinyl window replacement can be produced in various colors so you can choose one needed instead of doing such laborious and pain-staking work! Longevity. Vinyl windows are said to be installed once and forever. Over the time they will not undergo any deterioration (as wooden replacement windows will) and you will save on it now and in the long run. No color change. As said above: you don’t need painting anymore. But in case you decided to change the style of your house (and it doesn’t matter inside or outside) then you can face this problem. Here you will need to adopt your “new style” to the “old” windows. With vinyl replacement you might have these problems. Still plastic. Vinyl is still plastic. You can try to hide it behind the color and texture, but it remains the same. Manufacturing techniques are getting better every day, but vinyl still looks like plastic so far. Bad resale value. If you decide to resell your windows then you will get more money for the wooden ones. For now it is a question of fashion for Eco-friendly materials, but don’t give up, things might change soon! When first thinking of buying new windows it was decided to buy wooden ones. After the decision my family had to spend valuable weekend time clear-coating this purchase with Varathane. We spent not just time but also our mood, countless number of sponge brushes, cans of clear-coat. On top of it, we missed the time and waited too long to clear-coat the new windows and the smallest of us fingered smudges and dirt on replacement windows, so we had to sand them windows down. All in all we bought vinyl replacement windows. The wooden ones looked slightly better but vinyl is much easier to maintain. So if you want simple white windows or planning to paint your wooden windows white, just buy vinyl replacement windows and save your time and money. 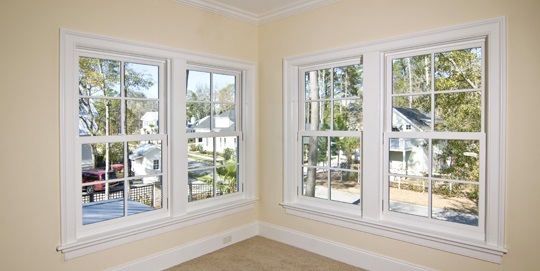 Ronnie Parker on behalf of Americanwindows.org vinyl window replacement company in Atlanta, writes about advantages and disadvantages of vinyl windows.